Dedication! Good luck in your challenge Eszter. Ever make 40 clove garlic chicken, with 40 actual cloves of garlic? Simmered very gently under olive oil, the chicken gets incredibly tender, and can be stored in the fridge for weeks under the oil, like a comfit. I generally take a few pieces out, toss them in the George Foreman, and they remain sumptuous on the interior, but get a crisp exterior. The remaining oil is perfect for brushing on eggplant before grilling it. Oh yum. There is NO such thing as too much garlic. Ed made an egg fried rice from leftovers for lunch today out of this book http://susanjanewhite.com/the-extra-virgin-kitchen/ and the garlic bit was a couple of cloves squeezed and basically stirred through it just before you take the pan off the heat – she’s big on semi-cooked garlic for the health benefits, apparently. Amazingly tasty. And just as well it’s not an office day, too. Another one is to do a mediterranean roasted veggies – peppers, courgettes, onions and whole garlic. Roasted in olive oil in a medium oven for 25 minutes. Don’t peel the garlics as you can pop them out of their skins when you eat, and they’re really sweet. I usually rob Ed’s. Good with couscous. I’ve got “The Complete Garlic Lover’s Cookbook”, from the Gilroy festival. And I agree: For a garlic themed dish, there’s no such thing as too much garlic. Especially if you use it whole, instead of crushing or dicing it. Entirely different flavor whole. I’m planning to make puttanesca sauce today for pasta, and I will probably use an entire head of garlic. Butter, olive oil, anchovies, garlic; not necessarily in that order. Heat until garlic and anchovies dissolve in oil and butter. Dip fresh vegetables in sauce and enjoy. Do not plan social interactions for the following couple of days. One of our favorites is shrimp in olive oil, red pepper flakes and garlic, tossed with fettucine and dusted with parmesan cheese. Start the pasta. It should be done about the same time as the shrimp. Clean, shell, and devein the shrimp. Heat olive oil in a 10-12 inch skillet. Add the shrimp, garlic, and red pepper flakes. Should take 4-6 minutes total to cook the shrimp. Drain pasta, add to skillet, and toss to coat. Serve, and dust with parmesan at the table. Goes nicely with a mixed greens salad. We do this maybe once a month. I think next week I might make 40 clove garlic turkey; We just broke down a whole turkey, and my wife is marinating one of the breasts in teriyaki with rosemary, to grill for dinner. (In our fireplace!) But the leg quarters would be nice cooked with garlic in a week or two. Glad to see you posting, Eszter! Does that sound right? Very intriguing! I just took some chicken out of the freezer. I love the list of things people are sharing, can’t wait to make these! That recipe sounds good, too, but the recipe I use actually requires enough olive oil to submerge the chicken pieces. Long, slow cooking under the oil infuses the chicken with a roasted garlic flavor. I do it stovetop in a cast iron skillet, but Alton Brown’s recipe isn’t much different. You can’t go far wrong with Alton Brown, in my experience. Heat the oil in a wok over medium-high heat. Add the garlic, ginger and chili. Cook until the garlic and ginger soften and become fragrant. Add the coconut milk and fish sauce, stir to mix, and bring to a boil. Preheat the oven to 400 degrees. Fry the eggplant until golden and the onion until translucent. Remove the stems from the tomatoes and fry them whole in the pan until the skin bursts. Neither the eggplant nor the tomatoes needs to be thoroughly cooked — they just need to be seared. In a baking dish arrange the eggplant with the onion and garlic on top and the tomatoes interspaced. Poke the tomatoes to make sure the juices will escape into the pan. If you’re so inclined, you may peel the tomatoes and cut them in thick slices. Sprinkle the garlic all over the dish. Add a squeeze of lemon juice, salt and pepper, and the water. Add the ¼ cup of oil in dashes across the assembled dish. Cover and bake for about 50 minutes, or until the eggplant is very soft when poked with a fork. Let it cool for about 10 minutes before serving. Sprinkle your favorite herbs and nuts on top of it. I like to add more lemon. As a main dish it feeds about four people with big appetites. As a side to meat, it should feed about six. You can use canned tomatoes if you’re in a hurry; they won’t hurt the dish. Some of these will have to wait until my oven gets fixed. And some will require buying ingredients I don’t have. But I’m taking note of all this deliciousness! Sorry, wrong bob. No matter, the dish is a good one, no matter which bob prepares it. I didn’t faint, but then I’m a little more of a sensualist — I think — than your average Imam. One of our favourite winter meals is roasted winter vegetables, similar to what Maria mentions. Sweet potato, potato, onion and garlic, and any other veg on hand—cauliflower, Brussels sprouts (yum!). Everything is diced and coated in olive oil, seasoned and then roasted in a 400 oven. Roasting time varies with the amount of veg. I use quite a bit of garlic because we like it, and season it with sage, parsley, oregano, basil, salt and pepper. We are vegetarian so we eat it with sage lentil sauce and Greek yogurt. If you want Romanian: ceafa la gratar. Obviously, in Romania one needs plenty of garlic. Is called “Israeli Salad” in some quarters. Requires a functioning oven. Way simpler than Imam Bayaldi. Take some whole eggplants of plump/dark aubergine variety (not thin Chinese that are also delicious but have other uses). Place on baking sheet. Oven on bake, 350 or 400 degrees. Put sheet with eggplants in, wait until they start to flatten visibly (exact time may vary). The peel may have a few burnt patches by then; this is not a problem. Allow eggplants to cool so that you can touch them. Cut in half lengthwise, scoop the meat with a large spoon. Do not discard the seeds. Light brown juice is oozing, keep some of it if you want to. Blend the scooped eggplants in a blender. Throw in as much garlic as you like, to have a strong garlic taste. Add a few teaspoons of mayonnaise if you want to. The dish acquires a but thicker, more jelly-like consistency if left in the fridge. It is great on crackers, bread, on a slab of cheese, or as a side. I also like to mix together some chopped garlic with some lemon juice and olive oil when I roast cauliflower. Or saute asparagus with a bunch of garlic. Of course the butter is softened, not roasted. Stir-fry anything stir-fryable with chilli, garlic, basil (+lemongrass if you can get it). Serve with lime. You can hardly go wrong with garlic, although you can go wrong. Some of the concepts presented at the Gilroy Garlic Festival are ill-advised, such as garlic ice cream and garlic wine. Actually the garlic wine would be fine for cooking, just not for drinking. bob: Your mention of the Jay F. Rosenberg book took me back to my student days. I don’t know if I still have it, since my wife got rid of a lot of my cookbooks when we got married. I used to like the chicken paprikash recipe. I don’t remember how much garlic was in the recipe, but since the chicken was extended with a lot of rice it could take quite a good amount of garlic. I remember Phyllis Diller’s advice for cooking with garlic. She said that people who don’t like garlic don’t eat it very much. Thus if you put in three or four cloves per person into your recipe, they won’t recognize the taste, but instead will think it’s something exotic and new. And don’t forget that garlic wards off vampires. We go through about 1-2 heads of garlic a week, and have never had a vampire problem. Mash a few peeled garlic cloves with some salt (the salt crystals help break down the garlic cell walls so you get a nice mushy paste.) Add 3 or 4 egg yolks. Start beating this mixture with a hand mixer (i used a wire whisk once and my arm nearly fell off); gradually drizzle in olive oil. VERY gradually at first. (If you add it too quickly and the sauce “breaks”, add another egg yolk and keep going.) You should be able to get at least a cup of oil mixed in. If the result seems too thick, beat in a few drops of hot water or lemon juice. I use this as a dip for vegetables–raw carrots, room-temp boiled potatoes, roasted beets, celery, whatever. My former housemate came back on Election Day here in Victoria to harvest the 40 odd garlic plants she had planted earlier in the year, so at the moment there’s a bunch plaited and drying hanging in the laundry. Gosh, all these incentives to get my oven fixed! Lynne, I love a good root veggie dish. Sadly, the one I made for Thanksgiving was disappointing (and a ton of work) so I got discouraged. But I’ll try your suggestion when I have access to an oven. I like the idea of Greek yogurt with it. maidhc – I am generally not a big wine fan so hard to imagine garlic wine would be good. But the recipe I used above does call for a cup of white wine, which worked very well with the garlic. bianca steele – Cauliflower, yum! Will try. guest – Thanks for the eggplant reminder. Suggestions here and on Facebook have made me realize it’s time I put it back on my agenda. I used to make it often, but for some reasons haven’t in a while. If you are comfortable with stir-frying and Chinese food find a Recipe for Yu-Xiang Jie-z (eggplant in a sauce with ginger, lots of garlic and chili paste) on the Internet. Fuchsia Dunlop has a great one. It is one of the classic dishes of Szechuan. One of my cookbooks gives the measurement of minced garlic as a “handful”. Just here to make a token protest about attributing a dish with an unmistakably Turkish name (imam bayıldı – the imam fainted/was delighted) to Romanians or Armenians. It’s a bit like reading about the famous Gaelic specialty ‘ToAd indhe Hole’. Oh, and garlic butter – mash some garlic into your butter – may be a useful culinary accompaniment to things like grilled chicken or to pasta. I make a very garlic-heavy houmous (I don’t have a specific recipe, but you always take whatever houmous recipe you like and add an extra half-head of garlic, and that has the advantage of not cooking it at all — if you specifically want raw garlic. Similarly you can easily make a garlic-heavy pesto which will be delicious. I’ll also add fresh garlic to any pasta meal — once the noodles are cooked I toss them with olive oil press a couple cloves of garlic into the mix. It will cook slightly from the heat of the noodles, but it keeps some of the distinct “bite” of fresh garlic. Brett, nice! I’m afraid I don’t have such an option. Aw, too bad. We made a point of getting a house with a wood fireplace, for just this reason: Used to cook regularly in the fireplace during winters in Michigan, and missed it when we moved down here to S.C..
Hi Eszter! We love garlic and use it a lot. Two easy standby’s: 1. garlic/lemon salad: Pull leaves of romaine off stem and tear into the size you like for salad. Mince 2 cloves of garlic (we always buy it already peeled in vacuum sealed bags–in produce refrigerated section usually). Sprinkle on leaves, along with generous amount of shredded parmesan, a few swirls of olive oil, a few hefty shakes of salt (to taste), and juice of 1 small or half large lemon. Toss and enjoy. 2. grilled tomatoes: buy on-the-vine tomatoes, cut in half crosswise, smear olive oil on each open half, salt and pepper and cover (we pile it on!) with minced garlic and broil (about 5-7 minutes, until soft and garlic is browned). We love this with pesto pasta. Thanks, Gillian. Both sound very doable so will pursue (Dan shared one on FB:). I kind of like peeling garlic, but if I’m going to add so much to my cooking perhaps I should go with the peeled version that several folks have mentioned. Also forgot to mention: the garlic lemon salad is great with store-bought roast chicken next to it! And you might be interested in Marcella Hazan’s recipe for this salad which does not use any measurements but says simply that you need four hands to make it: a generous one for the oil, a stingy one for the lemon, a judicious one for the salt and a patient one for the tossing. Tabouli salad is super easy and garlic-filled. Also, when making rice, add multiple peeled gloves at the start of cooking for nice pockets of cooked garlic amidst the rice. And garlic mashed potatoes. praisegod barebones, I’m pretty sure most of us who make this dish know where it came from originally, but few of us will want to re-fight the battle of Lepanto over a bit of eggplant. Would any self-respecting Neapolitan back in the day have put canned pineapple chunks and Canadian bacon on his pizza? Where were burritos really invented? Was Bernardo O’Higgins Irish? Please, can this not wait till after I’m done eating? 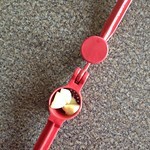 my sister-in-law visited and she ate raw garlic every day–simply taking a clove and biting. she’s a crudie–only eats raw food. i thought she would smell–reek, really–but she didn’t. i wrote to her later and asked how she did it (without reeking). she hasn’t answered yet. the aioli above is simple once you get the hang and is used in france in all sorts of ways, not only with veggies but with meat, fish, in soups. without the whisking, you can make pesto of all sorts–blending garlic, olive oil, and all sorts of other things. e.g., add walnuts or almonds for a really good pesto for pasta (you dont need the basil or parsley or other herbs). chop nuts and garlic finely with mezzaluna or blend with the oil with hand blender. when you cook dried beans always add some unpeeled cloves of garlic to the water. since you cant salt beans until the end this imparts favor while cooking. all sorts of soups can use whole garlic cloves. Would any self-respecting Neapolitan back in the day have put canned pineapple chunks and Canadian bacon on his pizza? But I had better not get started. I miss my grandma’s cooking, that’s all. If your main concern health benefits, why not just put it in some chicken soup? Re: 10. The shrimp can be replaced with good canned tuna and some lemon juice, fresh parsley if you have it. When you have the over on for some other reason, separate a couple heads, toss with fat, and roast for 30-45 min. Keep in fridge and add to dishes as you see fit. Garlic scamps and shoots are in season in the spring; if thet grow near you check farmer’s markets. Boil water and salt, then add grains. Simmer covered for 30-40 minutes, until the water is absorbed or thick. Add butter and minced garlic. Plus whatever spices you like. I like coriander, a little pinch of turmeric and a tiny pinch of clove. (You can add the garlic earlier if you don’t mind it getting cooked.) Add anything else you like — corn, peas, minced meat, cheese, etc. It comes out glutinous enough that you can treat it as a dip or a spread, or use it to stick other foods together, or just eat it. This will sound strange, but when I was an undergrad, a friend told me about the benefits of raw garlic for common colds. We lived in epidemiologically disastrous dormitories, so such minor bugs were a real concern. We ate in a dining cooperative, so we had access to a stocked kitchen, and began habitually swallowing small cloves of garlic whole, like they were pills. Without chewing or cutting the garlic, you don’t really taste it. I didn’t get sick for years — so I guess it works? Perhaps this could be a travel-friendly way to take your garlic habit on the road. J Thomas, will have to look for that ingredient, I don’t have it at home. If you don’t want to cook you could make pickled garlic, which is great. Or Kimchi or some other fermented Korean vegetable dish. The sauce should have lots of garlic in it. In north China they leave cloves of garlic out on the table to eat raw with your noodles or dumplings, so in a pinch you could always do that. Brett Belmore: I’m very interested in this grilling in your fireplace business. We have a small fireplace (Brooklyn apartment), but it works really well, and we’ve been thinking about trying to grill something in it. Are there things we should know about? 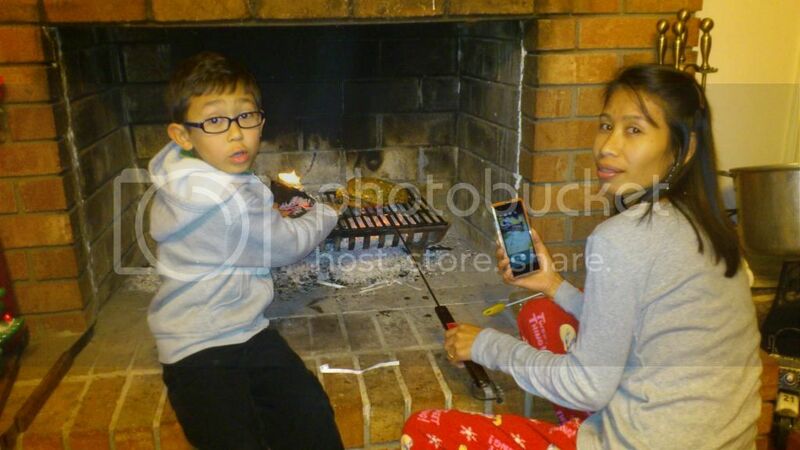 Looks, from your blog post, like you get the wood down to coals and then put the grill on top? Anything else we should know? Would probably start with something simple like steak. Or no? References to garlic to prevent colds remind me of a funny story from Andrew Weil’s Natural Health, Natural Medicine — he mentioned that he recommended to all his patients that they eat two cloves of raw garlic as soon as they felt the symptoms of a cold coming on [my usual method is to mince the garlic and eat it on toast with some kind of unctuous topping to cut the sharpness, like vegan cream cheese]. One patient came in and told Dr. Weil that he had followed his advice, eating the cloves straight, but it had been the hardest thing he had ever done. Upon being asked to elaborate it turned out that he had thought a clove of garlic was a head of garlic! Spaghetti puttanesca, as Keith Ivey mentioned above, is a quick and easy dish that incorporates garlic. Heat water for the pasta (I am decadent enough to always use fresh pasta, so I cook it when the sauce is done. Obviously for dried you want to start further in advance.) Chop finely some anchovy filets. Heat up olive oil in a sauce pan and add the anchovy, chopped minced or crushed garlic, and red chili flakes, and cook for 30 seconds to a minute, till the oil is nicely flavored. Add tomatoes of whatever sort y0u like, cooking 5 or so minutes for fresh, longer for canned. I actually use sun-dried as well as fresh, usually, adding the sun-dried a minute or two before the fresh to let them get acquainted with the oil. When the tomatoes are about done, add some kalamata olives and parsley. Capers are common in this dish but I hate them so I leave them out. When you serve it grate some parmesan onto the sauce or onto the pasta. As for cornbread. Jiffy is fine. Martha Washington, too. (Not that purely homemade is a chef’s feat.) Just follow the directions for ONE box. Forget the rosemary! (Well, go with it as an occasional excursion if you like, but, gee. Cornbread is American. 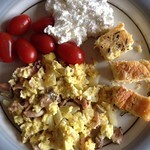 If you want to go Italian, there are better ways to use cornmeal.) If there are leftovers, here’s what you do. Slice cornbread wedges in half horizontally (I often labor to decipher horizontal/vertical in recipes: what I mean is, expose the bready surfaces), place on top butter (or, to be old school, pork fat), and broil. Delicious in the morning, delicious in the evening, delicious all through the night. Chicken sofrito – there are lots of recipes around, so try and find the one that adds the most garlic. The main trick is the judicious squeeze of lemon juice right at the end. It’s a dish that’s excellent in the winter because it looks tremendously warming as well as tasting delicious. The caramelised garlic tart by Ottolenghi in his amazing book Plenty is a bit involved, but if you buy the pastry ready made it’s not particularly difficult – and the outcome is impressive & delicious. In my family we have had this as an excellent Christmas vegetarian dish. If you’re going to do it on a regular basis, of course, they sell very cooking grates for fireplaces. Which are quite a bit more adjustable than the setup we used in the picture. This produces a marinated broccoli that is something like ceviche, as if cooked by the acid. The broccoli turns out to be bright green, softened but still crunchy, and the marinade is great. It’s vegan, but we omnivores like it, too. I like to garnish with sesame seeds. Some red pimento is nice, too, if I have it in the house. Adapted from the New York Times. 1. In a large bowl, stir together the vinegar and salt. Add broccoli and toss to combine. 3. Heat the olive oil until the first bits of garlic float to the surface. Exactly one minute later, turn off the heat. 4. Stir in sesame oil, spices, [tahini] and pepper flakes. 5. Pour mixture over broccoli and toss well. Let sit for at least 1 hour at room temperature, and up to 48 refrigerated. (Chill it if you want to keep it for more than 2 hours.) Adjust seasonings (it may need more salt and black pepper) and serve. Yield: 6 to 8 side-dish servings or more as an hors d’oeuvre. Add 10-12 cloves of garlic to white (“northern” or “navy”) beans while they simmer in a big pot. Also add shallots, small (“baby”) carrots, and a bay leaf. Simmer until the beans have become mushy, like a garbure. ‘We went into the room, taking the [garlic] with us. The Professor’s actions were certainly odd and not to be found in any pharmacopeia that I ever heard of. First he fastened up the windows and latched them securely. Next, taking a handful of the flowers, he rubbed them all over the sashes, as though to ensure that every whiff of air that might get in would be laden with the garlic smell. Then with the wisp he rubbed all over the jamb of the door, above, below, and at each side, and round the fireplace in the same way. Rubbing garlic on the toasted bread is best (though more time consuming), add tomatoes (or rub those too), basel and a bit of olive oil. Spaghetti Aglio E Olio. Saute garlic in olive oil, short of burning obviously, toss in cooked spaghetti, add fresh ground pepper and your preferred grated cheese. The OP made me think of a Shakshuka, for some reason, which from my understanding you can make as garlicy as you wish (from none to lots – also as peppery and eggy as you like) I had a delicious, cheap source of Shakshukas at one time so lived off them for a while, every other day more or less going on a year .. although Ive also found them in general to be very hit and miss. The ones I tried to make myself turned out pretty mediocre so I gave up on that, though I might have another go over the next few days as thinking about it has made me hungry. Anyway, I wont post a recipe (for reasons explained above) though there are plenty online (of course) Anyone have any wisdom to impart re Shakshukas, I’m all ears. If you eat bread, make garlic bread. Slice a baguette in half lengthwise. Saute garlic in butter and brush onto the bread. Top with cheese sprinkles (we use parmesan – mozzarella works too.) Toast in the oven until the cheese is toasty brown. And if you stir fry anything, it’s always better when garlic is added…. I have not tried this yet but I was looking at this last night. We were looking for an easy new recipe to try. I saw at least 3 very similar versions. This one was the easiest. We will probably try it this weekend. Some call for up to 40 cloves. Maybe start with 30? @58 Or leave out the hot pepper, replace the olives with tuna, and you have tonnato sauce, though I don’t know whether it could take more than a few cloves of garlic. To MaxSpeak’s Aglio e Olio at 68: Before tossing in the spaghetti, start an egg frying in an adjacent skillet. Do not let the yolk set, *and* do not let the white set all the way. Meanwhile add spaghetti to first skillet. Make sure the egg doesn’t set. Pour contents of first skillet into warm bowl. Slide in egg. Toss. (Egg will keep cooking but break up.) Salt and pepper to taste. Use two eggs if serving more than two people. Very restorative snack after a liquid evening. Obviously, any red pasta sauce should have garlic in it. Lots of it. Main Street Muses’ recipe looks solid. The one I use involves more veggies (in addition to the onion & garlic, I also saute chopped carrots and bell pepper), but otherwise it’s basically the same. When I make either Piccata or Scampi sauce, I use garlic. If you find a recipe that doesn’t include garlic, just add some. Damn, now I want some, and I’m trying to undo the damage I did over the holidays. My usual chilli recipe uses a few cloves of garlic, too. You may or may not taste it in such a dish, what with all the other ingredients, but given your goal here that should be fine. So make up some chilli and make sure to include some garlic even if the recipe doesn’t call for it. Wylie Dufresne once tweeted a recipe for garlic bread. Something to the effect of: roast head of garlic, puree the lot with parsley and butter, spread on generic hero loaf, halved, toast, top with parmesan, toast again. Broccoli rabe with garlic: chop or slice as much garlic as you want, then chop or slice some more. Cut about 1/4-1/3 of the stems off a bunch of broccoli rabe, dump in boiling water for a couple of minutes (you can skip this step and still have an acceptable dish, but most people would find the result a bit too crunchy). Saute the garlic in olive oil, add a pinch or so of red pepper flakes (sausage or pancetta or guanciale is optional and should be added here if using). When the garlic is sweated, not burnt, and the meat, if used, is browned, add b/r and a bit of the water, less than half a cup. Some lemon juice at this step is nice as well. Cook until the b/r is tender (somewhat longer if you skipped the blanching). You can do the same thing with regular broccoli, kale, chard, collards, or mustard greens. Cooking timew will vary. But all that is just an excuse to tell a story. Once when I was recently out on my own, I was preparing a recipe that called for two cloves of minced garlic. Although my mincing technique (in those pre-food-processor days) was pretty good, I had been slogging for 45 minutes when I decided to call my mother. I told her that I was trying to mince two cloves of garlic and after 45 minutes had gotten only half a clove done. She laughed and told me I had misunderstood what a clove was and was actually half-way through a bulb. The cloves were the individual pieces from the bulb. I used all the garlic I had minced anyway — a portent of garlic cookery to come. You can use white wine instead of the water of lemon juice. Sautée mustard greens (or any greens) with chili and garlic until just tender. Finish with a dash of fish sauce and lemon juice. That’s all I got. All I know about cooking is cut some stuff up and/or open some cans, dump it all in a pot and heat it up. Add a head of roasted garlic to this. For a long time, Whole Foods bulk sales was the cheapest place I found to get amaranth, cheaper per pound than 50 pounds online and cheaper than anywhere else local. Now the price has gone up closer to other southern grains like quinoa, it’s gotten popular among rich people. It has a sort of nutty flavor and it’s sticky. High protein and high lysine, which can make a difference to vegetarians. You can pop it like popcorn, it makes tiny popped kernels. You can grow your own but it’s highly invasive and easily takes over lawns unless it’s aggressively stopped. In the US south they call it pigweed. The young leaves and stems are tasty. The seeds are a big effort to harvest unless you have machines. When I tried it, I wound up giving most of mine unwinnowed to the birds, and it looked like it was mostly finches and slate juncos who wanted it. Note that it calls for 1/4 cup garlic for 3/4 cup cut up chicken, so the ratio of garlic to chicken really is quite high. I typically use an entire medium to large head of garlic. Also, I’ve found that adding just a little soy sauce at the end of the stir-frying darekens the chicken and making for a nicer presentation. It also makes it a bit saltier, though, which may not be to your liking. Salt the chops lightly, then marinate the chops in the garlic, parsley, thyme, paprika and lemon juice for 15 minutes per side. Saute the chops in a large skillet in a little oil, on each side, then add the marinade and reduce, glazing the chops. My roommate buys large bags of produce at Costco (because they’re cheap) and lets them rot (because she’s too busy to cook). I rescued the bag of garlic a few days ago. Peeled all the cloves and sauteed them in olive oil until they were soft, dark, and tasty. Then I decided to saute some onions, mix them with the garlic, and puree the whole mess. I froze half of this. I think the rest is going to be diluted with chicken stock and turned into soup. I will add sauteed veggies and cooked beans. Perhaps some sausage. I often make a big batch of onion-garlic-celery-carrot sofrito and freeze it in batches. A container of sofrito, a container of frozen cooked beans, and there’s dinner. With premade sofrito, you could easily have garlic every day. 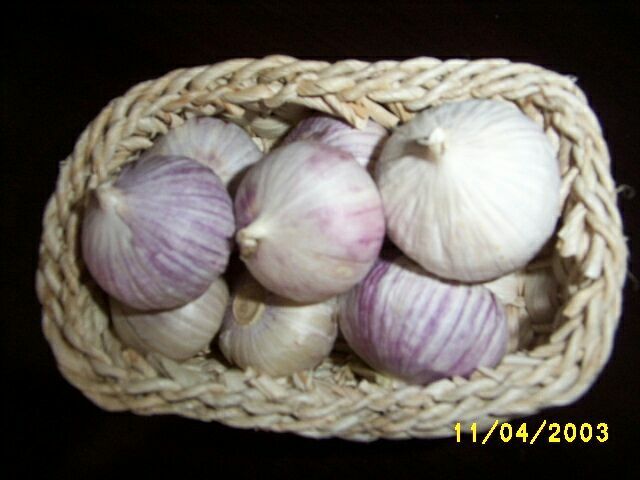 I buy a small basket of single clove bulbs of garlic, which are very easy to peel. I then halve them, chuck them in a food processor with plenty of olive oil, some salt and lemon juice, then press the button. The result is garlic purée which one can keep in a jar in the fridge and add a spoonful to anything and everything! Főzelék! With the exception, perhaps, of green pea or cabbage, there isn’t a főzelék that won’t be improved by adding some garlic, either in the dish itself or fried crispy on top. I’d start with sárgaborsó főzelék, krumpli főzelék, and tökfőzelék. Wonder why eating legumes on Jan 1st is considered good fortune. 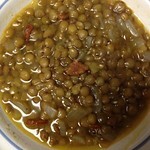 In at least parts of the US, blackeyed peas (often with hog jowl) are considered to be good luck for the coming year. Whole roasted cloves of garlic are also good as a pizza topping. This thread has some great ideas. I like # 86 and 87 above because anything that can be frozen or stored for later use gets my attention. I have just taken a batch of a sage lentil sauce I make out of the freezer for use with roasted vegetables, probably tomorrow. Eszter, I’m sorry your roasted veg were disappointing—that’s a lot of chopping for a poor return. It takes me 20 minutes to half an hour to prepare that dish, almost all chopping, which is why I like to serve it with sauce from the freezer. Sometimes I also make barley (pot barley, cooks up like brown rice) and salad to go with it. It is blistering cold here and all these recipes are warming. It seems only Corey Robin has mentioned steak. Steak grilled to taste seasoned with soy sauce and lots of fried to a brown crisp garlic slices is seriously lovely. There’s a crazed steak house near Ichigaya Station (dead downtown Tokyo) that does triple duty as a butcher shop, steak house, and a furniture store specializing in table tops made from slabs cut from trees with the whole width of the tree used as the table width (and custom cabinets), so you get to sit at some lovely tables. The steaks themselves are fine, but the only way to get the garlic is to order garlic rice (which is Japanese short-grained rice steamed with an amazingly large amount of fried to a brown crisp garlic slices). The salad, soup, mashed potatoes, and vegetables that come with the steak are terrible. But the steaks and rice and tables are good enough to make it worth going to occasionally. What,you may well ask, is a real effect ? are there fewer deaths in the garlic group ? are there fewer hospitalizations in the garlic group ? by it self, no one cares about high BP; we care about the sequlae like stroke. So high BP is a surrogate measure for something we care about – stroke. Say “I’m happy you are getting the chance to cook things you like”? There isn’t solid evidence for very much that people believe. But it’s reasonably clear that most people in good health do not find fresh garlic toxic even when they eat pretty much of it. So let them do what they want until we get good reason not to? There’s a long tradition that eating garlic is healthy. Whether it serves as a mosquito repellant (helping prevent malaria and other diseases that Eszter is unlikely to be exposed to), or whether it provides vitamins that people with modern diets are unlikely to have a deficiency in, or maybe it was an unfounded superstition all along … still it’s unlikely to be harmful. The benefits of eating fresh food instead of whatever corporate food is available is likely to overcome whatever health problems come from the garlic. So if she’s more likely to cook good food if she’s thinking about putting garlic in it, nothing terrible there. I still have my copy of The impoverished students’ book of cookery, drinkery, and housekeepery. The Imam fainted because of his new bride’s use of a liter of olive oil in the eggplant. I refused to allow my (no longer new ) bride to chuck my copy. I second the Bagna Cauda at #9 above. The next several days, you will smell garlic from the pores of your fingers, so you had best be with fellow users. Fennel and broccoli are excellent carriers, plus a good loaf of Italian bread to mop up every single last delicious flavorful drop. This goes best with a solid wine from Piemonte, such as a Dolcetto (not sweet, despite the name). GW @88 – Oh yes, főzelék of any and all sorts tends to be delicious! Someone mentioned above (I forget, I’ve been reading this gradually, but couldn’t respond until now) that they had a hard time peeling the garlic. Two suggestions. First, see the video @52. Although it didn’t work quite as beautifully for me, the process does make peeling significantly easier. The second option is to take a head of garlic without any peeling, put it in boiling water for about 15 minutes, set it on a paper towel to dry and cool off for a bit, and then peel. Again, it’s much easier. Some people have suggested buying peeled garlic. I almost did this, but decided that I didn’t want to go with whatever other things those jars may contain to make sure those garlic cloves last a long time. So I continue to peel my own, but it’s going much quicker with the above tricks. Yesterday, I wasn’t feeling well and wanted something without meat and without dairy (such sentiments are almost nonexistent for me so I must have been quite unwell). I ended up making an apple garlic mushroom roasted potato dish that turned out well. I’ll write up the details tomorrow. Continued thanks for the many additional helpful suggestions. I’m buying all sorts of spices I hadn’t used before thanks to the various ideas and will be trying several of the recipes mentioned above. J Thomas – Thanks for your response to #93. I’ll add that there are all sorts of deficiencies that we may well have that may go undiagnosed for a while. Whether garlic would help with those or not is another matter. e abrams – The link has dozens of references. Shocking as it may be, there are reasons other than extending one’s years to try to lead a healthier lifestyle. 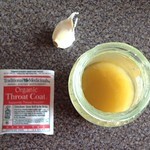 My main motivation right now is to avoid getting sick this Winter with something even as simple as a cold. Given that I work on a college campus where lots of people are sick on any particular day, this is not a trivial goal. If changing up some things in my diet may help, it’s worth it for me. I also think garlic is delicious and there are no clear detriments to consuming garlic in the amounts that these recipes require. It’s fine if the references or other material you can find to suggest garlic’s benefits don’t meet your needs for deciding to incorporate more garlic into your diet. Feel free to move along, reading this thread is not a requirement. Fresh uncooked is best. If you make some Thai prik nam pla, you can add it to rice or any other plain dish you make – to salt the dish up and add some spice. The fish sauce soaks into the raw garlic and takes the edge off it. You can use the whole sauce as a condiment, or just fish out the garlic and eat on its own. Take some Thai fish sauce, add lots of finely sliced garlic and some chopped small hot green chilies. That’s it. If you want a tastier dip for steamed fish, add extra chillies, some lime juice & sugar, and mash it up. Variation on garlic mashed potatoes: smashed new potatoes with their skins, seasoned with olive oil, coarse salt, lots of black pepper, and a clove or two of chopped garlic. Had this last night with broiled fish and side of spinach. The potatoes are only minimally smashed, not mashed. Chopped garlic in olive oil also makes a nice dressing for sliced fresh tomatoes, but that is a summer dish not a winter one. 31 days of garlic sounds like a bit of a toe-dipper, if we’re just talking about using garlic in something at least once each day. Without even trying, I’m pretty sure I’ve done 365 days of garlic a number of times in my life. Well at the very least this thread has inspired me to cook some new dishes so thank you to Eszter and to everyone else who contributed positively to the conversation. “There’s a long tradition that eating garlic is healthy. Whether it serves as a mosquito repellant (helping prevent malaria and other diseases that Eszter is unlikely to be exposed to), or whether it provides vitamins that people with modern diets are unlikely to have a deficiency in, or maybe it was an unfounded superstition all along … still it’s unlikely to be harmful. And this is 100% right and 0% wrong. Michael Sullivan – Yes, I appreciate that much food includes garlic anyway. This is probably true of my diet as well. The difference here is that I’ve been focused on making something new every day (that’s not my usual approach) and, importantly, using as much garlic as possible in it. For example, I’ve been tweaking recipes to include much more garlic than suggested. It tends to work well. I seem to be consuming several cloves a day, which is likely more than I would otherwise. Harold – That’s a nice simple salad dressing that I will make one of these days. It’s definitely not summer here, but I always love a tomato salad regardless of the season. MPAVictoria – Yes, great ideas suggested on this thread, I’ve already been trying out all sorts of things. Glad you found it helpful! Garlic has known and potential interactions with over 200 prescription drugs, especially if taken in supplement form. My understanding was that the benefits (anti-biotic) of garlic come primarily from fresh garlic, not cooked (though cooked garlic is delicious and probably still has healthy minerals). I don’t know if this would apply to foods like pickles which are traditionally made with fresh garlic, though fermentation in itself is said to be beneficial to health. I suppose the garlic in pesto qualifies as uncooked — provided you make it fresh and don’t store it. My mother used to freeze chopped basil in olive oil without the garlic in ice trays and add garlic when ready to serve, since she said freezing spoiled the taste. She also added garlic to salad dressing (vinaigrette) in the French manner. I myself think it this is best when the greens are strongly flavored, or cruciferous; when they are mild, I leave it out, so the flavor can come through. My Italian stepfather and friends generally looked askance on the use of garlic as not genuinely Italian — except when used to make pesto, of course, not to mention abbacchio alla romana, for which it is essential. Eszter @97 – ah, nice one ! Right, Im gonna have to do it. I bought a bag of tomatoes the other day aswell but it completly slipped my mind. addendum — Spaghetti aglio e olio, of course. Can’t be beat! Harold – I’ve been having quite a bit of fresh garlic although not every day. If you have it fresh in chunks, it really stays with you the whole day, which is not horrible, but a bit intense. Ronan(fr) – Hope it works out for you as well. Some of the reviews of the original recipe weren’t favorable, but it worked for me. Of course, what spices you use is pretty flexible, I just posted about what worked well for me that one time. Now off to make some bean soup for tomorrow. Eszter, if you were to chop it up quite finely I am sure it would be just as efficacious, healthwise, as preparing it in chunks, but milder in its immediate effects. Not that “staying with you” is a bad thing — helps one feel satisfied — which I’m sure was no small part of garlic’s age-old appeal, especially in those times and places where food wasn’t very abundant. Unless your goal was to prevent cavities or gum disease or sinus infection through direct application by mastication and having garlic fumes go up your nose! That reminds me that my mother used to “flavor” the vinaigrette with a whole clove of garlic before hand that she would then “forget” to take out before serving, so someone at the table, family or guests, would get the eye-watering surprise of chomping down on a whole clove of garlic while enjoying the salad course. I noticed also that nine times out of ten, my mother herself would be the one who “got the garlic.” So I guess she basically really liked it. Try Korean cuisine, which uses garlic in practically every dish. I recommend trying Bossam, or Kalbi, whereby you’re eating whole pieces of grilled or steamed meat with rice wrapped in lettuce or other greens, with cloves of garlic dipped in ssamjang (soybean bean paste). Of course, there are also plenty of soups and stews to chose from, all of which have garlic as an ingredient. Delicious!